Whenever one of my out-of-town friends pays a visit to New York, I always recommend they book their return flight from Newark Airport, and I even magnanimously offer to drive them there. They are often skeptical of the offer, but invariably accept, as JFK and LaGuardia are usually crowded and expensive to travel through in comparison. On the way to the airport I suggest stopping in Newark for lunch. My guests typically will nervously laugh, assuming that Newark is a cross between an episode of The Wire and Robocop. Surprise. We drive into an area of Newark known as the Ironbound, where urban blight, crackheads, and dreary industrial scenes give way to cheerful two-story brick buildings, flower-decorated sidewalks, green spaces, and restaurants lining the streets. The name comes from the old ironworking plants, which were magnets for the Portuguese laborers who used to populate the neighborhood. In this small Portuguese enclave, deep within the gritty confines of Newark, sits Sol-Mar restaurant on Ferry Street. My mother first introduced me to this place some time ago. She and my father had frequented the restaurant for years with their Portuguese friends and knew the menu inside and out, forward and backward. The secret to Sol-Mar’s popularity lies precisely in its simplicity and attention to detail, both hallmarks of the Portuguese work ethic. Upon entering the establishment, one first notices the bar, which sits in the middle of the cheerful, clean, and unpretentious restaurant. 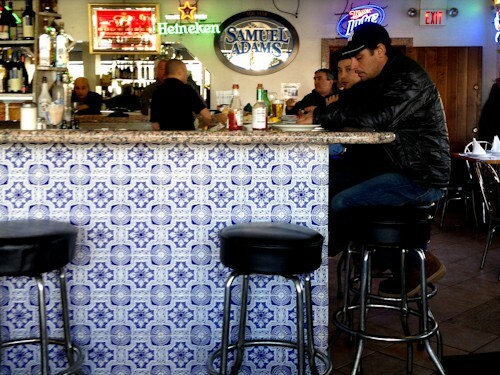 Surrounded by green and red flags and Porto soccer jerseys, it boasts intricately-laid blue and white tiles and its barstools are always chock-full of laborers, merchant marines, longshoremen, and contractors. The bar buzzes with rapid-fire conversations, hearty laughter, and huge plates of bacalao and other specialties being devoured in industrial quantities. If I hadn’t pulled of the Jersey Turnpike, I would swear I was in Lisbon. At Sol-Mar, which means “sun and sea,” two signature examples of Portuguese craftsmanship are on display: tilework and perfectly prepared seafood. 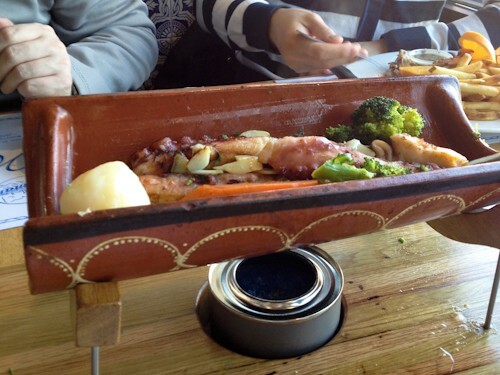 My favorite dish at the restaurant doesn’t always appear on the menu, but will nonetheless be prepared for me upon request: grilled octopus on a roof tile. 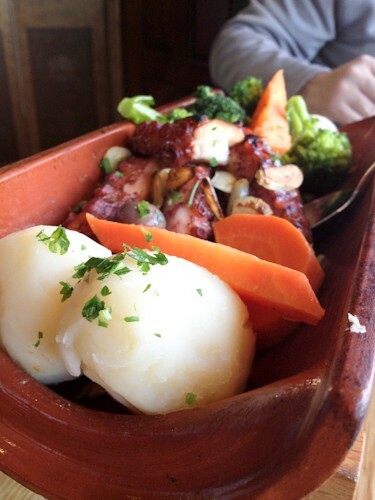 As the name of this dish implies, it’s the playful fusion of these two Portuguese specialties. The buttery, sumptuous octopus is grilled on the plancha, seared with olive oil, lemon, and a dash of oregano. Cooked until it is the perfect balance of firm and melt-in-your-mouth tender, its purple skin is almost crispy, always slightly salty, and insanely satisfying. Along with the octopus, some al dente carrots and broccoli are tossed in a long, rounded terra-cotta roof tile, and warmed over a can of sterno. A side dish of boiled potatoes lends no-nonsense, starchy balance to the exquisite octopus. Served with an ice-cold Sagres beer, the meal is so good, I can’t wait to drive my next friend to the airport.